Several of our lists are available in to download in Excel format. These digital lists are available as a separate cost. See below for prices on downloading individual lists or a total package of eight lists. Questions? Contact Jessica Sabbath at jsabbath@va-business.com. This package includes downloadable Excel files of the following lists: Accounting firms; Architectural and Engineering Firms; General Contractors; Insurance Brokers; Law Firms; Commercial Real Estate Firms; Public Companies; Private Companies. The package is $195. List of the largest accounting firms in Virginia based on the number of CPAs as of Jan. 1, 2019. List of the largest architectural and engineering firms in Virginia based on Virginia billings in 2018. List includes the largest commercial real estate firms in Virginia, based on portfolio of leasable square feet. Includes the largest general contractors that have a major presence in Virginia. Rankings are based on billings in Virginia from 2018. 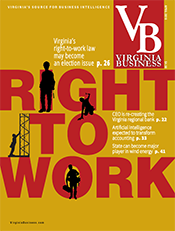 Largest law firms in Virginia based on the number of attorneys in Virginia as of Jan. 1, 2019. Includes a sampling of Virginia’s largest private companies, ranked by revenue. List published March 2019. List of largest public companies headquartered in Virginia, ranked by revenue. Data come from SEC filings and company's websites. Data were collected Feb. 14 and included 2018 results or trailing four quarters.